This weekend and the next 2 following weekends are all about Competitive Minion Masters! King Puff Cup this weekend, Monday Night Masters on Monday (6pm CEST), The Master’s Challenge next weekend. Saturday 4th, King Puff Cup 11 is coming up! Votings for the ESL Go4 Series are still running until Monday 23rd of October. If you haven’t voted already, please do so now! It’s your decision, if Minion Masters is entering the ESL now or after the official release next year. Every vote matters! Expeditions are over? Not really! Lately, there was a lot of talk & rumours about the Expeditions. New players might not have known about this, but it was clear from the beginning that Expeditions would only be available for 3 weeks. Sorry for any inconvenience. Last Wednesday, we disabled the Expeditions temporarily. But they will return next Wednesday! Additionally, we want to note again, that Expeditions are not meant as a seperate game mode. They are meant as an addition to the existing Ranked modes and Draft. You need Supplies for the Expeditions. These can be collected via campfires (Local Supplies which built up over time), via playing Ranked or Draft mode, via Daily Quests or via Watch & Win. With this you can see, that Expeditions and the other game modes are intertwined. 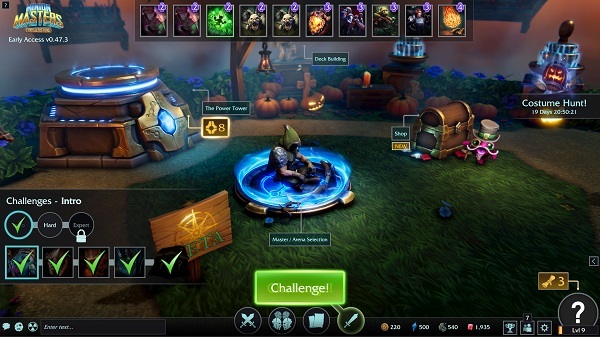 Minion Masters enhances its popularity with LAN events & Game Conventions. A while ago, we were part of the Net.Con Playground Vol://8! This German LAN event is well known and attracted a lot of attention with tournaments in games like Counter Strike: Global Offensive, Hearthstone, Overwatch, Call of Duty 4, Trackmania, Beer Pong, osu!, Enfo's Team Survival, etc. This year another title was introduced: Minion Masters! According to the promoters, the LAN event was a huge success. Tickets were sold out a month before it was held. The visitors’ feedback was amazing. Local eSports teams competed in several tournaments during the amazing weekend. Also, a copy of Minion Masters was handed out to every visitor. There even was a little Minion Masters Contest! But what are we talking about, have a look at the Net.Con Playground Vol://8 for yourself. And that’s not all! We’re proud to announce that Minion Masters will be part of this years’ Art to Play! In 2016 there was more than 27000 visitors. This years’ Art to Play takes place November 17th to 19th in Nantes, France. We’re excited to see the outcome and the feedback from the crowd! Edelweiß presented two new videos. The first video was all about Stormbringer Control. In this video guide, Edelweiß explained the cards in the deck, strengths and weaknesses and commented on replays. At the time he recorded the video, he was rank 8 on the 1vs1 leaderboards. Later on, he managed to reach rank 3 with this deck! The second video featured a 2vs2 match. Edelweiß named it: Black Hole Wars. It’s hard to explain what happens in this video, so better see for yourself! Thanks to Edelweiß for the effort and the content! Lately, some Puffs were talking about more Community Content in the future. Well… we don’t know for sure, but Puffs never lie. That brings us to the end of this Fridays’ Community Happenings as we prepare ourselves for the King Puff Cup weekend. By the way: Do you know who that might be?